Columbia Our ACORN Home Savers Campaign committee had been in Charlotte, North Carolina and was scheduled for Columbia, South Carolina some 90 minutes away. Panic pedaling about massive numbers of visitors and traffic jams because of the 2 ½ minutes scheduled for the city because of the total eclipse, had us on the road at 530 am for an 8am meeting. Of course we were sitting at a McDonalds having breakfast and chatting by 7am within a mile or two of our destination. The traffic seemed normal on the interstates. Reports from all around the country seemed to confirm something along the same lines. There was little panic and uproar, just heads facing the clouds. We had ordered our special eclipse glasses, 100 times stronger than regular sunglasses, weeks before, and, yes, they were certified, so we had no worries. We had tried them on the night before in Charlotte, and initially were surprised that we were essentially staring at black, since the glasses emitted no light. Jamie Jimenez from Philadelphia finally shined a flashlight app from his phone right to the rim of the glasses and we saw enough light to believe we would be OK and full-fledged members of the geek parade. 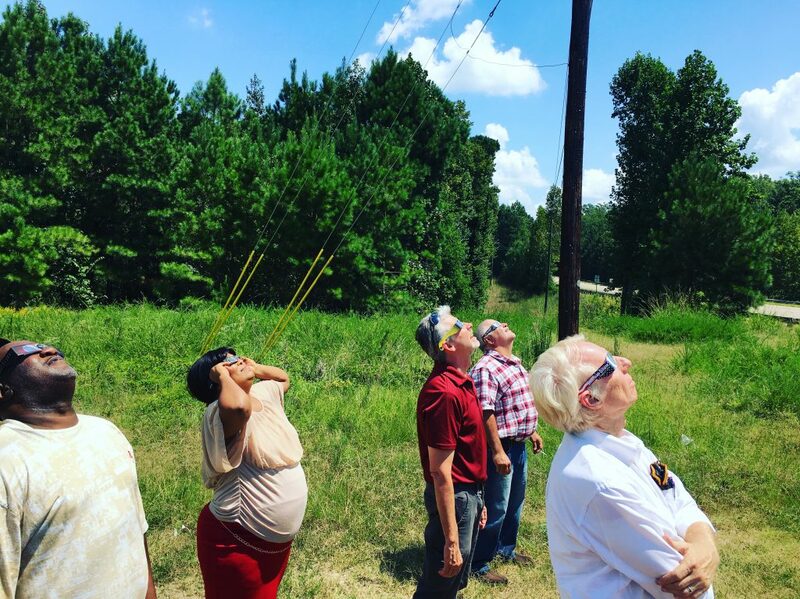 We drove out of town to a small town called Blythewood which was in the band of totality. The park looked like a picnic area. We stopped at a wings-and-ribs place around noon that had a line by the time we left with parking lots full. 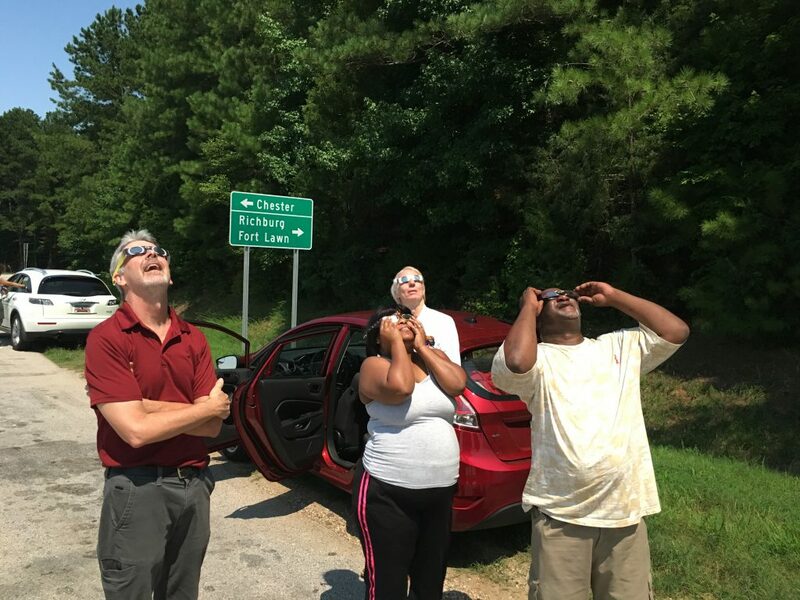 Families stood by the hoods of their cars or crouched in air conditioning as the moon started its creep across the edge of the sun. We stood there and did the same. Some of our team had earlier planes, so after ten minutes or so, we decided to move up the highway. The next stop was right at the edge of totality about 35 miles from Columbia. Neon signs flashed warning cars not to just pull off the side of the road, and very few did, though I thought that would have been a pretty good idea. There were a couple of cars at a turnoff there, and we measured the eclipse again. It was all amazing, but we voted to be happy with almost 99% and move even closer to Charlotte. The next stop at a Pilot truck stop the lot was full. People parked everywhere. There was a party and festival atmosphere. We failed to get ice cream, so the next exit we just pulled off by the side of the road. There was an 18-wheeler that had done so across the highway. We were going to see it through the next 20-minutes. A young African-American woman parked on the side of the road about 30 feet up from us minutes later. She was holding a baby, had a youngster in the back seat, and was clearly pregnant again. I walked up and asked if she wanted an extra pair of our glasses so she and the kids could see the eclipse. A yellowish light was forming around us as totality approached. A breeze came up and the temperature dropped noticeably. Crickets suddenly started chirping and jumping. Nelson Griffin, one of our team from Detroit, was bitten by a ladybug?!? We were in awe at power of the universe, and humbled. Our young mother and neighbor walked up and thanked us after the celestial show was over before we piled in for the run to the airport and home. It was an amazing display of the magic of the world, but it was also a brief period in America when we were actually one community, facing in the same direction, one people under the moon and sun, the way we were meant to be, and never are. This entry was posted in Citizen Wealth, Financial Justice and tagged Columbia, eclipse, home savers campaign, South Carolina by Wade. Bookmark the permalink.